Boreus sp. Photo by A. Staudt. Boreus is the main genus in the family Boreidae, a holometabolous insect family found in the northern parts of Eurasia and North America. Boreids are active during winter, when they are found among patches of moss on which they lay their eggs or on snow drifts between mossy rocks. Their apparent affinity for snow (the main source of moisture in the cold but dry habitats they prefer) together with their jumping movement gives them the common name of "snow fleas". Boreids also resemble fleas in effectively lacking wings - females lack them entirely, while males have the wings highly modified into a pair of large stiff hooks over the back (the individual in the photo above is a male). These hooks are, of course, useless for flying, but are used by the male in mating. As described by Cooper (1974): "An ardent male, when within some millimeters range, springs at the female, ensnaring her with his tong-like wings while seizing whatever he can of her extremities with one or both of his genital claspers". After the male's grip on the female has been secured (not always a simple process - see Cooper, 1974, for fuller details) and their genitalia have been conjoined, he may carry her about on his back in the mating position for several hours (the hook-wings are not actually used to hold the female while mating, only in the initial grab). Most authors have included the Boreidae in the order Mecoptera, the scorpionflies. However, both molecular and morphological data have indicated that the Mecoptera as traditionally recognised are paraphyletic - from a phylogenetic perspective, the Siphonaptera (fleas) definitely and the Diptera (flies) possibly can be regarded as mecopterans. 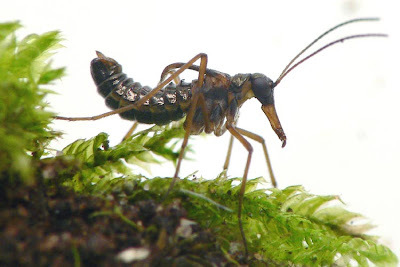 As a result, some authors have proposed restricting Mecoptera to a monophyletic core (the panorpoid families) and removing the families Boreidae and Nannochorista (a Gondwanan genus whose larvae are aquatic predators in streams of chironomid fly larvae) each to a separate monofamilial order. Both molecular and morphological data agree that the boreids are the sister group to the fleas (Grimaldi & Engel, 2005), making the name "snow flea" rather prescient. An alternative suggestion by Novokshonov (2002) that boreids are derived from the Palaeozoic family Permochoristidae is, as pointed out by Grimaldi & Engel (2005), rather weakened by the point that permochoristids are known only from isolated wings, making it somewhat difficult to understand how they could be compared to boreids and a relationship suggested in the first place. Cooper, K. W. 1974. Sexual biology, chromosomes, development, life history and parasites of Boreus, especially of B. notoperates, a southern Californian Boreus. II. (Mecoptera, Boreidae). Psyche 81: 84-120. Novokshonov, V. G. 2002. Order Panorpida Latreille, 1802. The scorpionflies (=Mecaptera Packard, 1886, =Mecoptera Comstock et Comstock, 1895, +Neomecoptera Hinton, 1958, +Paratrichoptera Tillyard, 1919, +Paramecoptera Tillyard, 1919). In History of Insects (A. P. Rasnitsyn & D. L. J. Quicke, eds.) pp. 194-199. Kluwer Academic Publishers: Dordrecht. Ahh, so I lose any points I might have scored for guessing the family by calling them "scorpion flies" when in fact it's a little more complex than that. Rats. I'm sure Chris can add more details but 'holometabolous' refers to insects that undergo complete metamorphosis" - butterflies, beetles, flies etc.